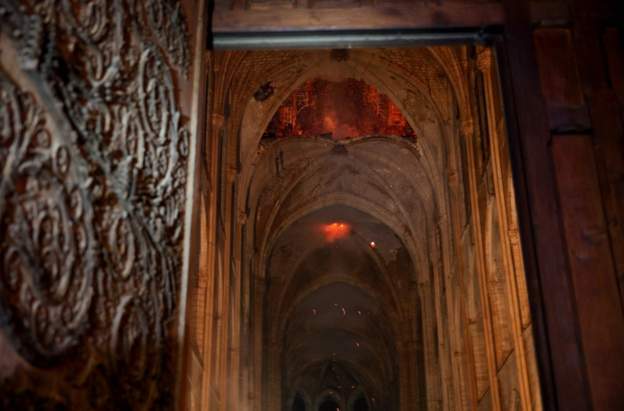 A number of officials are now saying they are not sure they will be able to save the cathedral. I was there in 1983, and it is ( was? ) one of the most impressive structures I've ever visited. An incalculable loss. No amount of money spent on an eventual reconstruction will make up for 800 years of history gone up in flames. Not to mention the time required. If they undertake to rebuild using authentic construction methods it could take 100 years. The Cathedral of Saint John the Divine in New York was started in 1892 and is still under construction. From the location it looks like it might be linked to the renovation. I wonder if there was “cost cutting “ in re fire safety. There was a notable reluctance on the part of the government to provide funds, so much of the money was raised privately. Every news report seems to be laying blame on the renovations. It if, of course, the fate of the government to be blamed for excessive safety regulations and outrageous expenditures, unless something goes wrong, in which case they are blamed for lax safety measures and skimping. A lot of confusing reporting. In the photos I have come across all of the smoke and flame seems to be above the level of the vaulted ceiling. I do not entirely give up hope that the main part of the structure will survive. It seems now that the main structure can be saved. But this is an incredible disaster. I don't remember anything like it. No one seems to have been hurt or killed, and for Catholics, reports seem to indicate most of the priceless relics & artworks were able to be saved. It’s always sad when something like this happens though; a vast number of historic sites of great importance have been destroyed over the past 20~ years and it doesn’t get any easier when the culprit is negligence rather than, e.g., ISIS or Al-Qaeda or a natural disaster. The reports I have seen are a bit disconcertingly insistent it was an accident. They cannot know. Obviously an accident linked to the renovation has to be the obvious suspect, but no one can possibly know for sure. France 24 interviewed one guy who said he did not understand how it could be still burning because it’s made of stone. I understand time constraints, but they couldn’t find anyone with any knowledge at all? There are dozens and dozens of huge cathedrals across Europe. St Peter’s, Salisbury, Exeter, Westminster, Ulm, Milan, Cologne, Vienna plus a dozen other Notre-Dames in France alone. I suspect emergency measures, fire protection and contingency plans, insurance quotes etc will be looked at in the coming weeks. This is the most revealing photograph I have come across, of the interior. Part of the stonework of the vaulted ceiling has collapsed. This is profound structural damage and could compromise the overall stability of the structure. The primary purpose of the flying buttresses in a gothic cathedral is to the balance the stress of the ceiling vaults and if the ceiling vaults completely collapse those buttresses could push the walls in. Seems like the authorities are saying the main structure has been saved, but restoration will be a very substantial and complicated job. I'm not really a religious person, but am fascinated by history and art, and am an avowed francophile. I last visited the interior of Notre-Dame some 8 years ago, but saw it last from the outside in December 2019. They say the organ survived. Apparently the three great rose windows survived. For now at least. As has been pointed out above, there are reasons to worry about the structure. Here is another: fire can make mortar fragile. Anyway, that is the best possible news, considering what we saw happen. Speaking of the mortar. The 19th century spire used cement not lime mortar, and that was a key part of why it needed fixing. It seems the 13th century builders knew better. There are recent reports that the structure is sound, although I'm not sure to what extent is meant. Indeed, as noted above, mortar as well as the limestone itself can be weakened by fire. I think the best news is that the ceiling vaults are intact except for three holes. Given that the fire was in the roof, the most vulnerable part of the stone structure would be the ceiling vaults. It is a relief to realize that when they spoke of the "entire wooden interior destroyed" they were referring to the wooden structure between the vaulted stone ceiling and the lead roof. There was no fire inside the building, so the stained glass windows were presumably spared the heat and smoke of the fire. On the other hand, who knows how much lead was released into the atmosphere when the wood fire burned under the lead covering of the roof and spire. I guess the question now is what form the reconstruction will take. The spire was a 19th century replacement for the original, which had fallen more than a hundred years before. It seems that replicating a 19th century addition would be a peculiar thing to do. They might try to re-imagine the original spire, or they might replace it with something representing a 21st century aesthetic. That might be more in line with the spirit of the Cathedrals, which were constantly being repaired and added to with new architectural elements during their long lifetimes. And the roof. A wood and lead replica, or maybe a Plexiglas affair like the pyramid they built at the Louvre. I suspect the ceiling vaults will be a major issue. Several vaults fell, but probably others (maybe all of them) are structurally compromised and in danger of collapsing. Maybe they all will require major repair or replacement. Makes me think of the World Trade Center. They decided to make the original site a memorial and build a big building next to it. That would not be my choice. I would have rebuilt it the original World Trade Center exactly as it was, as if it never happened. The top floor might have been a prison block for Al Qaeda, where they would have to daily look down on a thriving New York City.